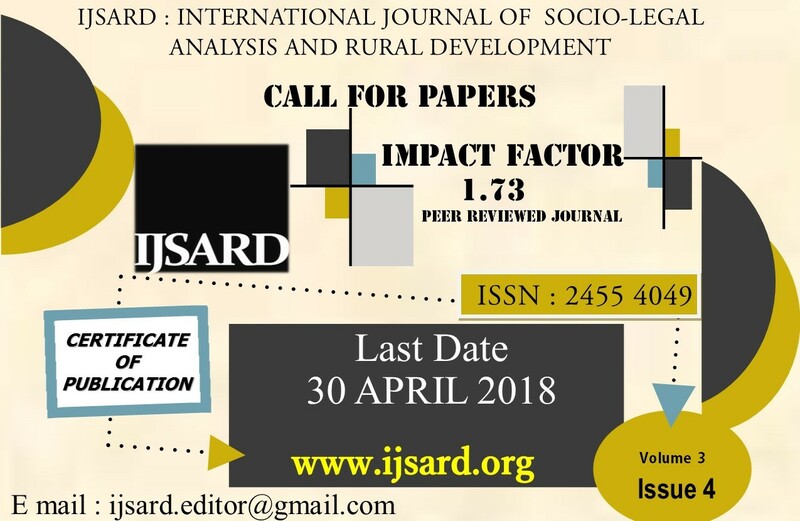 Get your article published in an internationally indexed journal with a high impact factor of 1.73. International Journal of Socio-legal Analysis and Rural Development (IJSARD) is an online quarterly peer reviewed international journal on ‘Law’ and ‘Rural Development’. As the name suggests the journal will focus on the analysis of different laws for better understanding and research. The society needs the laws for proper functioning and thus the journal focuses to draw a special emphasis on various disciplines of social sciences, rural development and analysis of various aspects of law to improve the quality of research and explore the more realistic aspects of civilization’s sustainable developments. Establishing equilibrium between the society and law it will find the present and futuristic scope of growth and prosperity. Rural development is an essential part of a sustainable society. An abstract of not more than 200-250 words. Short description about the author. Formatting and Other Essentials: Main text: Times New Roman, Font Size 12, 1.5 spaced, Footnotes: Times New Roman, Font Size 10, single spaced. The articles must be sent to [email protected] by 30th April, 2018. The submission must accompanied by a declaration that the contribution submitted is a piece of original research work of author and has not been published or submitted for publication elsewhere. All submissions will be subject to a plagiarism check. Co-authorship will be allowed to a maximum of three authors and three separate certificates shall be issued for the publication of article in the journal. The hard copy of certificate of publication. A sample paper for their reference. The journal in form of a CD. All the selected articles will be on the website.